In France, during the month of January, these galettes can be found in almost any bakery. 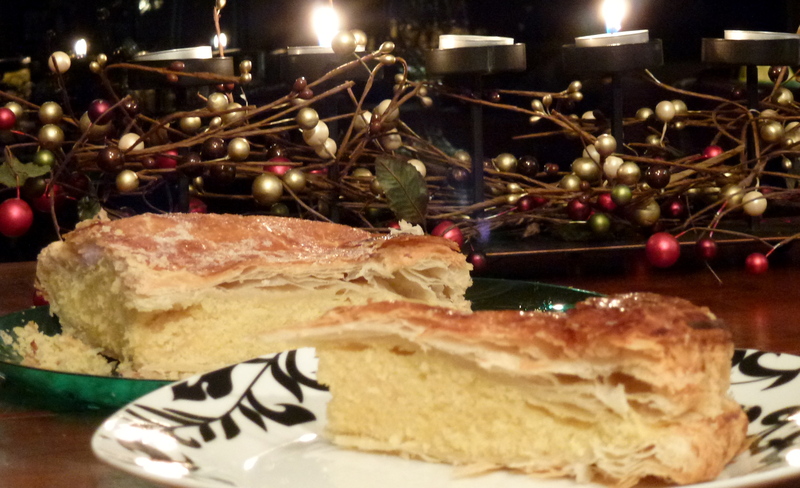 The name Galette des Rois can be translated to Kings’ Cake and is named after the three kings (or wise men.) This “cake”, which is actually more of a pie than cake, is made from puff pastry (pâte feuilletée) and filled with frangipane. It is traditionally eaten on the 6th of January, although it is also commonly eaten throughout the entire month. The best part about this cake, isn’t actually the cake itself. It is the “fève” (bean) that is hidden inside. Whoever ends up with the bean in their piece gets to be King for the day. “Why a bean,” you may wonder. I, for one, find a bean to be an odd choice, and I have no idea how that idea came about. Nowadays, however, a small ceramic figurine typically replaces the bean. To encourage fairness when giving out the pieces, the youngest in the family goes under the table and calls out the name of the person to which the next piece will be given. After finding the fève, the King (or Queen) is usually given a paper crown to wear. C’est très cool, non? I made my own puff pastry for this recipe. I find the homemade variety to be so much better, not only because of taste, but also because of the satisfaction it gives me to make everything from scratch. Unfortunately, this wasn’t the best puff pastry I’ve ever made. I was a little out of practice and had a bit of butter leakage. If you’ve ever made puff pastry, you may know what I’m talking about. As a result of my so-so puff pastry, I’ve decided that such a finicky pastry deserves its own post. If you want to make your own galette and are feeling ambitious, hold out until this weekend, as I am currently writing up a recipe for puff pastry. Otherwise, just go the easy route and buy it frozen. 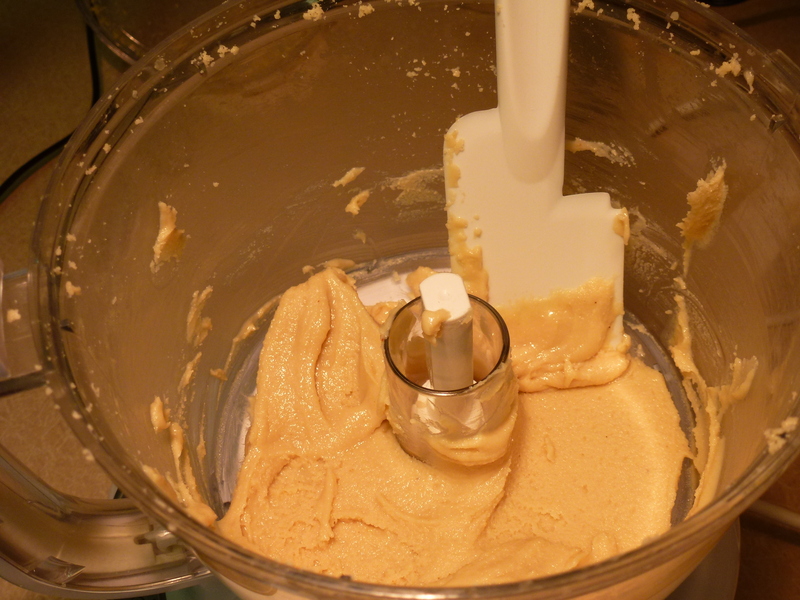 Mix together the almond paste, butter, sugar, and flavourings. Mix in the eggs, until smooth. Then mix in the cornstarch, until combined. Roll out one sheet of puff pastry. Using a pie dish or cake tin as a stencil, cut out a circle in the pastry. Repeat with second sheet of puff pastry. Transfer one dough circle onto parchment paper and then onto a baking sheet. You can do this easily by rolling the circle onto a rolling pin and then rolling it back out on the parchment paper. Set the second dough circle aside for later. Spread the frangipane over the pastry, leaving gap around the edge of the pastry. Whisk together the egg yolk and milk to make the egg wash and then brush over the edge of the pastry. The egg wash will act as a glue to hold the two pieces of pastry together. Place the second dough circle on top and press the edges together with a fork so to create a seal. Otherwise, you risk having the filling seep out while baking. Brush the entire top with egg wash, being careful not to let it drip over the sides. Using a sharp knife, score the top of the pastry with a design, if desired. Bake at 400 F (200 C) for approx. 40 min or until golden and crispy. Oh yeah, don’t pretend that you have the bean, if in reality you do not. People don’t like that.